With over 24 million vehicles and more than 170,000 miles of roadway, road injuries and crashes are the leading cause of preventable deaths and injuries to California’s 8 million children. But engineers are working hard to ensure that cars and car seats are designed to keep kids as safe as possible. It’s up to every parent to take advantage of these innovations by making sure their car seats and booster seats are used and installed correctly. Correctly used child safety seats can reduce the risk of death by as much as 71 percent among infants and 54 percent among children aged one to four in passenger cars. Safe Kids California and 18 Safe Kids coalitions statewide are working hard to teach parents how to keep children safe in child safety seats. For the best possible protection, keep your baby in a rear-facing child safety seat in the back seat for as long as possible– up to the height or weight limit of the particular seat. Recent recommendations (March 2011) by the American Academy of Pediatrics (AAP) urge parents to keep their babies rear-facing up to the second birthday. The old rule- 12-months-and-20-pounds- that many parents cite when turning their child forward in the car is actually the minimum size and age requirement. Keep babies rear-facing in a convertible seat until they reach age 2 and the maximum height or weight allowed by the manufacturer. For many children that will be 30, 35 or even 40 pounds. Rear-facing occupants are safest. Use your baby’s car seat rear-facing and semi-reclined no more than 45 degrees, so the baby’s head stays in contact with the seat and the baby’s airway stays open. Read the car seat instructions. Make sure the buckled harness straps that keep your baby properly positioned and secured in the car seat fit snugly. Loose harness straps don’t provide maximum protection. Be sure the harness is tight, so you cannot pinch extra webbing at the shoulder. Position the shoulder straps through the slots at or below your rear-facing baby’s shoulders. Use either the car’s seat belt or LATCH system to lock the car seat into the car. Do not use both systems at the same time. All car seats have an expiration date. Generally, it is six years, but contact the manufacturer of the seat to find out what the expiration date is for your specific seat. Never buy a used car seat if you do not know its full history and never use a car seat that has been in a crash. Do not use any products in the car seat that did not come from the manufacturer. 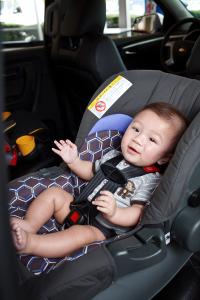 Car seat fabrics meet strict fire safety codes. Add-on toys can injure your child in a crash. Find where the frontal airbags are in your vehicle by checking the owner’s manual. Never put a rear-facing car seat in front of an active airbag. Children are always safest in a back seat. Have your car seat checked by a currently certified child passenger safety technician to make sure it is properly installed. Never leave children alone in a car. Does your child exceed the car seat’s rear-facing height or weight limits? Is your child’s head within one inch of the car seat top? Use a forward-facing car seat correctly and until the harness no longer fits (convertible or combo seat) in a back seat every time your toddler rides in a car. Many harnesses today serve kids to 50, 60, 80 or even 100 pounds. Use the right car seat with a harness for your toddler’s weight and height. Toddlers are weighed and measured at every doctor visit, so be sure to keep track. Put harnesses through the slots so they are even with or above the forward-facing child’s shoulders. Some seats require use of the top slots when the seat is forward-facing, so check instructions. Use the car’s safety belt or LATCH system to lock the car seat into the car. Do not use both at the same time. Be sure to use the top tether. Use a top tether if your vehicle and car seat are both so equipped. Tethers limit the forward motion of your child’s head in a crash. Do not allow children to play with unused seat belts. Treat them as you would any rope or cord. If you have a heavier or taller child, find a car seat with a harness that fits larger children. Some seats hold children up to 80 or 100 pounds. Refer to manufacturer’s instructions. Restrain all children in the age- and weight-appropriate child restraint when in a car with the motor running. That will limit access to power windows. Never leave children unattended. VIDEO: Having Trouble Installing Your Car Seat?